Around the year 1150 German settlers from the region of rivers Rhine and Moselle started coming to Transylvania. Villa Hermani was one of the first villages founded in the region of Sibiu and of the Cibin River (a tributary of Olt River). In 1191 the name Cibinium was used for a locality, and in 1223 a locality named Hermannsdorf (Village of Hermann, in German) is confirmed. In 1224 the rights of the Saxon settlers are guaranteed by the Hungarian king Andrew II through the Andreanum Act, also known as the Golden Bull. 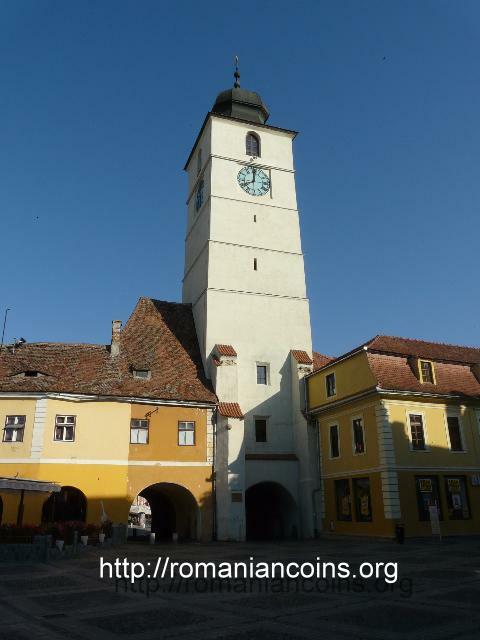 In 1366 Sibiu became city. At the time the city was named Hermannstadt (City of Hermann, also German). 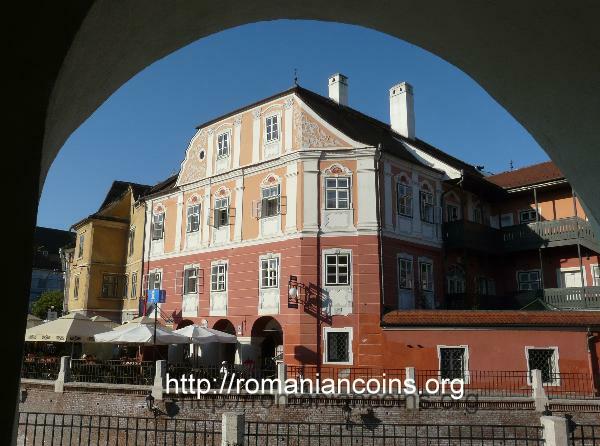 Since 1692 forth, for a century, Sibiu was the capital city of Transylvania. The name of Sibiu became official only after the Great Union of 1918. Hermannstadt or Sibiu was one of the seven German cities in Transylvania that gave the German name of the province: Siebenbürgen, or Seven Boroughs. The other towns of fortresses were Bistritz (Bistriţa), Klausenburg (Cluj-Napoca), Kronstadt (Braşov), Mediasch (Mediaş), Mühlbach (Sebeş) şi Schässburg (Sighişoara). 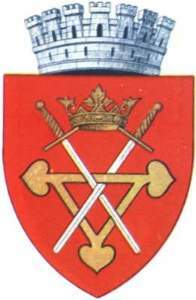 The seven fortresses appear on the coat of arms of Transilvaniei and so on the Romanian coat of arms. The European cultural capital program started in 1985, having the Greek minister of Culture Malina Mercouri as initiator. In 2007 the European Cultural capitals will be the city of Sibiu in Romania and Luxembourg, the capital of the Grand Duchy of Luxembourg, both old German cities. It is believed that there were also Luxemburgers among the settlers of Sibiu. 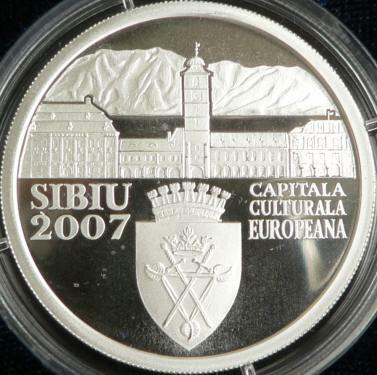 The coin was put for sale on December 11th 2006, the last Monday before the official opening of the Sibiu - Cultural European Capital program, that took place on December 17th 2006. The coat of arms of Sibiu is described in and approved by the Decision no. 1541/2002 of the Romanian Government. The shield is antique type. The two crossed tip down swords support by their cross-guard an open golden foiled crown. The swords skewer weavingly a linden foiled triangle with the tip toward the base of the shield. "Crossed swords, tip down, signify, accordingly to the mithology of medieval usage, the taking of possession over land, the will of citizens to defend the municipium and their civic rights. Foiled crown, called by Transylvanian heraldry "Corona Regia", signifies the status of free royal city. Red tincture on the shield signifies local constitutional autonomy. Foiled triangle, sign of a the unity of trinity, signifies civic solidarity. The coat of arms as a whole symbolizes the community of Sibians, and the gold signifies citizens' aspiration toward prosperity. The seven tower mural crown indicates the status of municipium. The foiled triangle was the heraldic sign and the seal of the Universitas Saxorum of Sibiu (the representative assembly of the Germans in Transylvania, suppressed in 1876). The Council Tower defended a gate belonging to the second fortification belt, inside which the City Hall was placed. Today the address of the Council Tower is Piaţa Mică no. 1. Nowadays the tower has seven floors. It was built during years 1225-1240, being mentioned for sure in 1370. It was reconstructed in 1588. In 1824 the old roof of the tower was replaced with the actual roof. 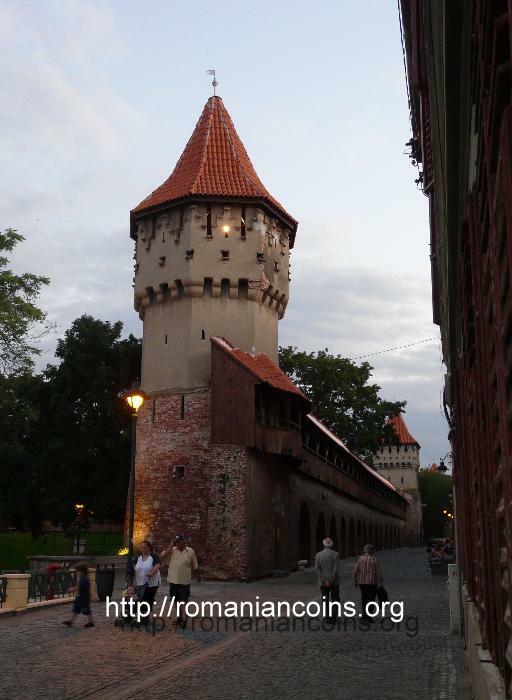 The Carpenters' Tower is placed on Strada Cetăţii (Fortress Street) and was built in the 15th century. It is a part of the third fortification belt of the city. Only three towers of this fortification belt still exist today: the Tower of the Carpenters, the Potters and the Arquebusiers. 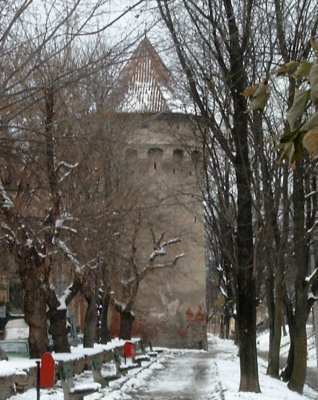 The Potters' Tower is placed also on Strada Cetăţii (Fortress Street) and can be dated back in the 16th century. The tower can be even older, because its base is square, and during the 16th century the towers were already fitted for artillery, that is circular shaped. The Potters' Tower is joined with the Carpenters' Tower through a stone wall. 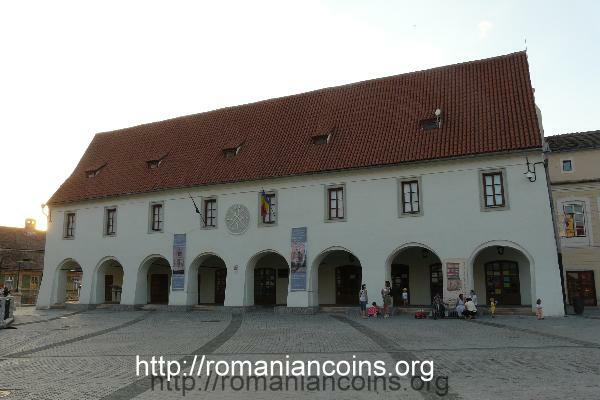 The Brukenthal Museum was established in 1817 on the collections of baron Samuel von Brukenthal (who was governor of Transylvania, 1777-1787). The main part of the building was erected between 1778 and 1788, in baroque style. The address of the museum is Piaţa Mare no. 4-5. The House of Arts is placed in Piaţa Mare no. 21 (Large Square) and is dated back in the 15th century. It has eight arcades. The House of Arts was also known as the House of Butchers, after the stores at the ground floor. Concluding the 1878 restoration, the coat of arms of the city was installed on the front side of the building. On the coin this coat of arms is visible as a small point in the center of the facade. The Luxemburg House is placed in Piaţa Mică (Small Square), at no. 16. It was restored between 1999 and 2003, with funds from the Ministry of Culture and from the Bureau of National Monuments of the Great Duchy of Luxembourg. It was inaugurated in 2004. 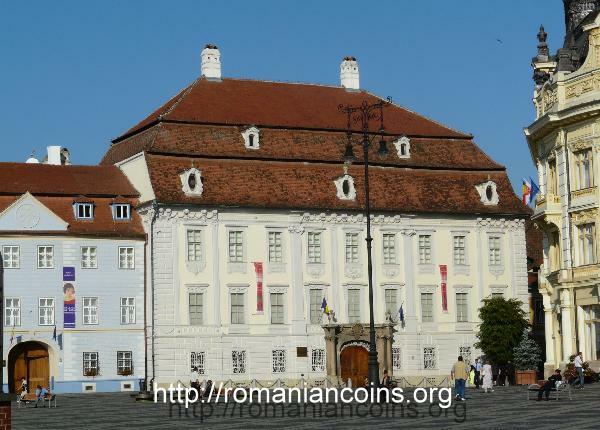 Another building from Sibiu is represented by Romanian numismatics. 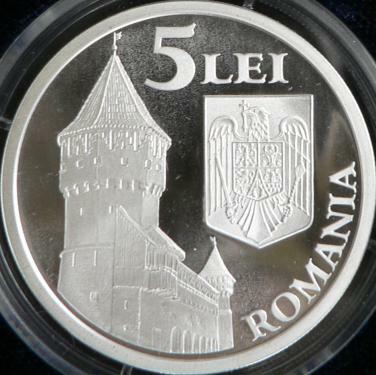 It is the Orthodox Cathedral appearing on the silver 100 lei 1998. This coin commemorates 125 years from the death of Andrei Şaguna, the metropolitan of Transylvania (with see at Sibiu).